Last fall when I interviewed sculptor Timothy Cleary for my column in The Reader I learned about a new project he was working on, a monument that would honor POWs featuring Cdr. David Wheat, a Duluthian who spent seven years and four months in the infamous Hanoi Hilton during the Viet Nam War. The dramatic concept featured a shackled David Wheat in his cell, leaning toward a massive door with a slot and bars. The finished piece was to be installed at the Duluth International Airport where it would accompany the sculpture of Tuskegee Airman Joseph Gomer, also produced by this artist. The monument, which has been years in coming to fruition, will be unveiled this Friday at 4 p.m. at the Commemorative Airforce Building across from the Base Exchange (directions at the end of this blog post.) The reason this piece is being unveiled at this location is because there had been some disagreement regarding where it should finally reside. Here is the backstory on how the monument came to be. 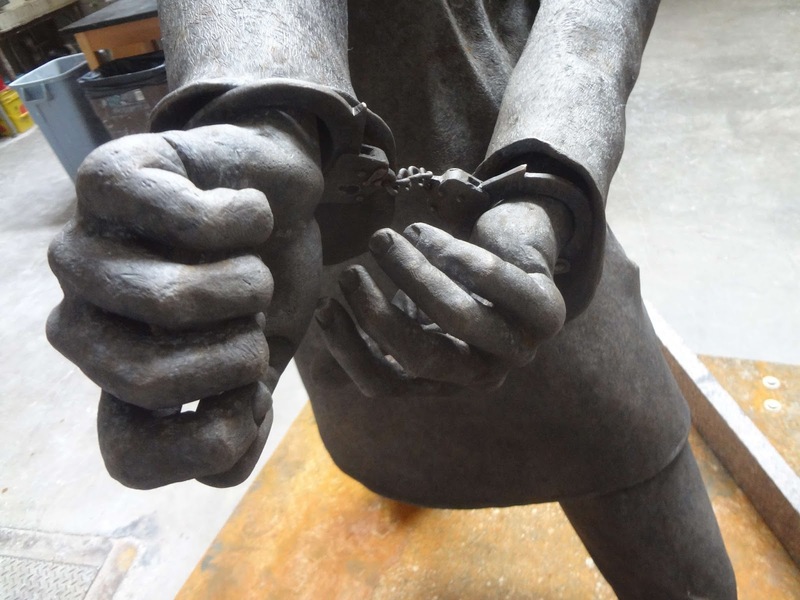 30 pieces were cast and welded together to form the statue. For a number of years some of the veterans in this area had been talking about a way to honor Commander USN (Ret.) David Wheat, a radar intercept officer in Vietnam whose plane was shot down in 1965. After being taken prisoner he endured one of the longest POW terms on record before his release in February 1973. This past year, through the efforts of the Northland Veterans Services Committee, the project began to come together. According to a Duluth News Tribune story in May 2014 quite a few people had a hand in bringing the monument to fruition including Mike Forsman of the St. Louis County Board, commissioner Pete Stauber, veteran Tony Guerra, the late Durbin Keeney and veteran John Marshall, project chair of the "Commander David Wheat and the Prisoner of War Project." 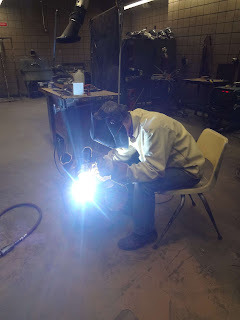 Cleary welding earlier this spring. John Marshall stated that the original plan was to install a monument in February on the date of Commander Wheat’s return to the Duluth in 1973. 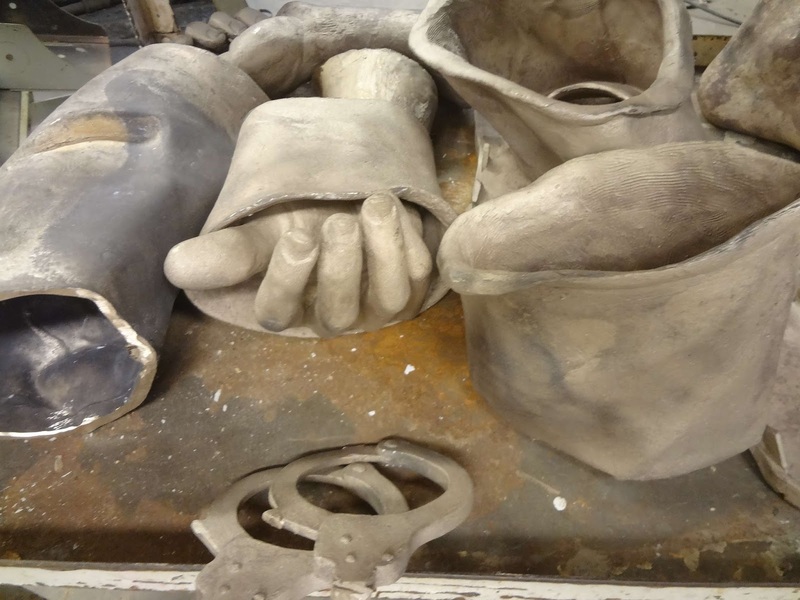 "The sculpture will be of Commander Wheat. He'll be kneeling, with his hands behind his back, and looking up through a prison cell window. It's very powerful," Marshall said. Frequent travelers through the Duluth International Airport are probably not aware that Timothy Cleary, who teaches metal sculpture at UWS, was the creator of the sculpture honoring Joseph Gomer, a statue especially impressive because of the flowing delicacy of its remarkable details. The artist approached this new piece in an entirely different manner, and the result makes a powerful statement that is impressive and memorable. Early sketch of the concept. One facet of this project that was important to the artist was meeting Cdr. Wheat whose humility touches everyone who meets him. David Wheat expressed gratitude for the efforts behind this monument. In addition to his own story being told on panels surrounding the sculpture, the names of all Northland POWs will be listed as well. I had a chance to visit with Tim Cleary in his Hermantown studio early in the project. Here are some shots from that visit and a later visit after the bronze pieces had been cast in preparation for final assembly. In a later post I will share more of Cdr. Wheat's story, whom I also had the privilege of meeting. The artist studied photos to reflect his subject's features and character. An early sketch that was ultimately discarded by the artist. Life-sized clay model helps artist see he's on the right track. In a later blog post I will share details of the Cdr. David Wheat's experience. In the meantime, Friday will be the unveiling of the completed monument. I was asked not to share photos of the completed statue until after the unveiling, but I can attest that it is impressive. To attend the unveiling: If coming from the Mall area drive north on Hwy 53 make a right on Stebner Road (at Gordy's Farm market), which becomes Airport Road and circles around to the left. The Commemorative Airforce building is just before Cirrus Designs at 4931 Airport Road.